Lieutenant Colonel William Charles Michell, MC, VD was born in Claremont, Ontario on 1 February 1868, son of Charles Michell and Rebecca Pangman. He graduated from University College with a BA in 1890 and became a teacher. Eventually Michell rose to Principle Riverdale Collegiate Institute and Superintendent of Toronto High Schools. Hurt Was Slight and He Remained on Duty. Major W.C. Michell, of 695 Broadview avenue, has cabled from France that he is slightly wounded in the arm, but not at all seriously. The family received the official wire this morning stating he was remaining on duty. 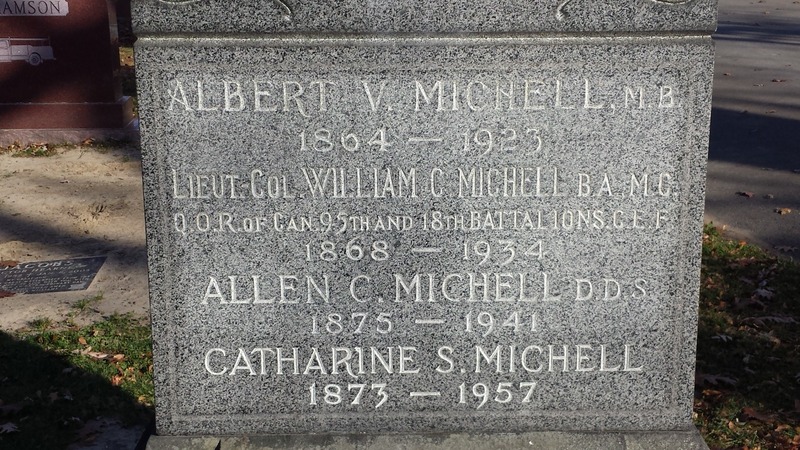 Major Michell was born in Claremont, Ont. In 1869, and completed his education, taking several degrees at Toronto University. While there he was champion long distance runner and generally a good athlete. Later he taught at Whitby and Ridley Colleges, Jarvis Street Collegiate as classics master, and for five years was the principal of Riverdale Collegiate. Major Michell held that rank in the Queen’s Own long before war was declared and in May, 1915 was appointed as transport officer in England. This, however, did not please him, although the authorities found him the right man in the right place. Eventually Major Michell told the War Office that he would revert to the ranks, if he might go the front, and in May, 1917, was sent to the 18th Battalion. Michell died 9 March 1934 and left a trust fund to provide scholarships for students attending University College, University of Toronto which was still active in 2012.